Madrid is the largest city in Spain. It is also the capital city. It's a popular travel destination for its art and culture scenes, but it is also thought to have one of the best nightlife scenes in the world. Many young travelers head to Madrid to party into the night. If you're hoping to see this side of Spain, then any of these hostels will help you get started. 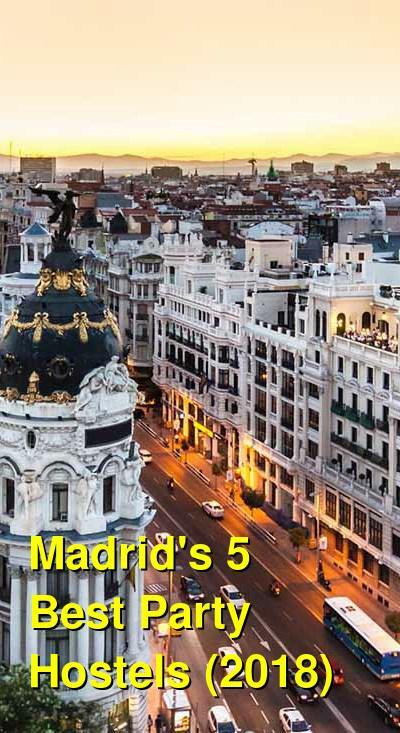 How much do hostels in Madrid cost? What are the best party hostels in Madrid? Madrid's Cat's Hostel is one of the most popular party hostels in Europe. At the Cat's Cave Bar, which is open late into the night, you are sure to meet other travelers. There are organized pub crawls almost every night as well as tapas and shopping tours, free dance classes, and a regular paella party every Saturday night. The rooms are decent and diverse. You can choose from dorms with anywhere between 4 and 14 beds. Clean sheets and lockers are provided and a complimentary breakfast is served. Wi-fi is also available in the common areas and public computers are available for your use. The hostel is conveniently located just outside the center of Madrid, Puerta del Sol. 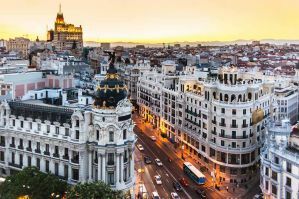 It's easy to reach any of the city's most popular sites including the Santa Ana plaza, the Prado museum and Retiro Park. If you're looking for the best hostel in Madrid to party with other travelers, then this is a place you can't skip. Mad Hostel is near Madrid's 'museum triangle', the bars and restaurants of La Latina, and Puerta del Sol. The central location, comfortable beds, and relaxing atmosphere will make you never want to leave Madrid. Living Mad hostel's location is unbeatable. It's a 5-minute walk from the bustling center of the city, Puerta del Sol and steps away from the world-famous Prado museum, refreshing Retiro Park, and Atocha rail station. And when you're ready for a break in your adventures or a little siesta, chill out in the colorful common room, with walls lined with graffiti of the best sites in Madrid. Also, make your way up to the rooftop terrace; the perfect place to soak up the Spanish sun. Whether you're ready for a night out on the town or looking to explore more Spanish culture, Mad has activities for you every day and night of the week. Their pub crawls are top notch, the best way to party with your fellow travelers. We also offer tapa and shopping tours, and free Flamenco and Salsa dance classes. And if you're looking for more, the receptionists are available 24 hours to help you see the best of Madrid. The newly renovated rooms range from 2 to 6 beds, each with clean sheets and secure lockers for each guest. Breakfast is included and available every morning with a variety of pastries and cereals. Wi-Fi is free and there also computers available for guests use. Linens are included with your stay and towels are available for hire. Sungate hostel can be found in a prime, inner city location - easily accessible from the airport and the main train station. This backpacker base is in the heart of the city; in a neighborhood called Centro, next to the city's historical sights, main attractions, nightlife, and shopping area. If you stay in this hostel, they promise to show you a new way to discover the city; the staff will recommend restaurants, night life, and cultural activities that may not be on the common tourist list. The mixed and female dorms are spacious, bright, and specially designed for backpackers. All of them are equipped with air conditioning and lockers, and there are no bunk beds. In the spacious common area you can relax or socialize with fellow travelers and the staff. The fully equipped kitchen is at your disposal where you can enjoy some beers and have a bite to eat. Free city maps, city tours, Wi-Fi, and linens are included with your stay and towels are available for hire. Mad4You Hostel offers travelers high quality accommodation at affordable prices. Enjoy a fun and relaxed environment where you can mix with people from all over the globe. The building is a charming typical 15th century Madrilenian household that has been recently renovated in order to offer guests every comfort. Mad4You Hostel is just few minutes away from Tribunal and Noviciado Metro Station and features a shared kitchen, a bar, and a laundry service. Free Wi-Fi is available in the common areas and in the dormitories. Every dormitory either has its own bathroom or access to a shared bathroom with a shower. Bed linens are provided and breakfast is included with your stay and towels are available to rent. All the dormitories have private lockers that can be used with your room key at no extra cost. The hostel provides discounted tours and a 24-hour front desk. This hostel is conveniently located in the Tirso de Molina neighborhood, so it's very close to the center of the city. There are also some great markets nearby and plenty of museums. If you've come to Madrid to party, then this hostel has plenty of activities for you. There are regular pub crawls, Flamenco shows, and tapas tours, as well as a walking tour of the city. Every Saturday night there's a tango dance celebration which is free to all guests of the hostel. The hostel also organizes day trips to a variety of nearby locations including Toledo, Segovia, El Escorial & Aranjuez. This is a very active hostel with no shortage of activities or guests looking to make new friends.